The present study was undertaken to study the trends of area, production and productivity of food grain in the northeastern states. The study was based on secondary data from 1980-81 to 2011-12. The data was collected from several government publications and web site. To analyze the trend of area, production and productivity of food grains in northeastern states, the linear, quadratic and exponential functional forms were used. To fit the trend, linear functional form was used due to its higher R2 value as compared to other two forms. Besides these, compound growth rate, coefficient of variation and instability index was also estimated. The effects of area, productivity and their interaction towards increasing production were also estimated in the present study. The growing of food grain crops was not risky in the northeastern states as revealed by the lower coefficient of variation. The coefficients of variation (CV) of area, production and productivity of food grain crops were less than 0.551 per cent. The instability indices for area, production and productivity for food grain crops in the northeastern states were positive and thereby indicating less risk for growing food grain crops in the region. The increase in production is due to increase in area as well as interaction of area and productivity of food grain crops in the states. Anonymous. (2001). Statistical Handbook of Nagaland, Millennium Issue. Government of Nagaland, Kohima. Anonymous. (2003). www.northeast.databank. Shillong. Access on 23 April 2004. Anonymous. (2012). www.dacnet.nic.in/eands. Delhi. Access on 14 April 2012. Barah, B. (2001). Northeastern India - Strategies for Agricultural Development - An Overview. Proceedings. Prioritization of Strategies for Agricultural Development in Northeastern India. Published by NCAP. 1. Cavery, R. (1991). Groundnut Production in Tamilnadu - A Decomposition Analysis. Agric.Situ.in India. 58: 321. Dhakre, D. S. and Sharma, Amod. (2010). Growth and instability analysis of Ginger production in North-East Region. Agric. Sci. Digest. 30: 142-147. Padnaban, N. R.; Singh, V. V.; and Singh, M. (1996). Cotton production in Tamilnadu. Agric. Situa. in India. 53:169-73. Saikia, A. (2001). 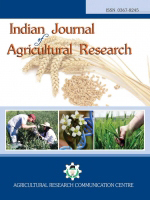 Performance of Agricultural Economy in the North East India - Constraints and Performance. Proceedings. Prioritization of Strategies for Agricultural Development in Northeastern India. Published by NCAP: 16. Sharma, Amod and Kalita, D. C. (2004). Trends of area, production and productivity of food grain crops in north eastern states. Nagaland Univ. Res. J. 2: 31-37. Sharma, Amod and Kalita, D. C. (2008). Trends of area, production and Productivity of Major Fruit Crops in Jammu & Kashmir. Agric. Situat. in India. 65: 477-488.